AMRO Advisory Panel at the meeting on July 4, 2018. From left to right: Dr Feng Lu, Dr Maria Socorro Gochoco-Bautista, Dr Akira Ariyoshi, Dr Bandid Nijathaworn, and Professor Kyung-Wook Hur. SINGAPORE, July 4, 2018 – Members of the Advisory Panel (AP) of the ASEAN+3 Macroeconomic Research Office (AMRO) met today to review and discuss AMRO’s surveillance on ASEAN+3 regional economies. AMRO presented on the recent macroeconomic developments and challenges in the ASEAN+3 region, in particular on the developments in, and impact of trade and capital flows. AMRO also briefed the AP on the findings from its recent Annual Consultation Visits to Myanmar, Indonesia and Thailand. There was also an in-depth discussion on the preliminary results of AMRO’s thematic study on “China’s 40 Years of Reform and Macroeconomic Strategy: Prospects and Implications for ASEAN”, which the AP viewed to be very relevant and timely. AMRO Lead Economist Dr Chaipat Poonpatpibul presents preliminary results of the thematic study on China’s 40 Years of Reform and Macroeconomic Strategy. 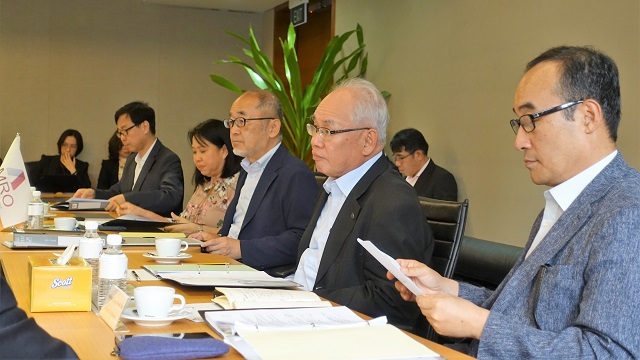 The meeting was attended by Dr Akira Ariyoshi, Dr Bandid Nijathaworn, Dr Maria Socorro Gochoco-Bautista, Professor Kyung-Wook Hur, and Dr Feng Lu. 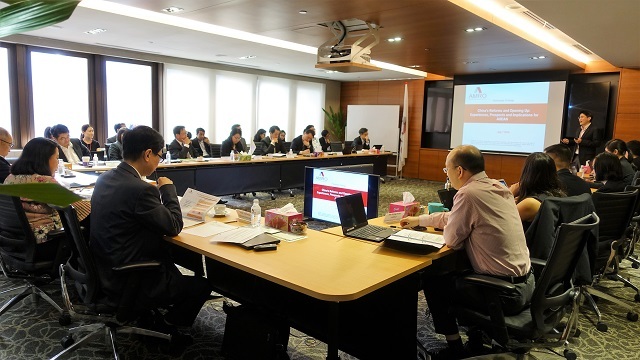 AMRO Director Dr Junhong Chang, Chief Economist Dr Hoe Ee Khor, Deputy Director (Administration) Mr Byungseo Yoo, and Deputy Director (CMIM, Strategy and Coordination) Mr Yasuto Watanabe also attended the meeting. The meeting began with the AP members electing Dr Mohamad Ikhsan to serve as the new AP Chair, succeeding Dr Akira Ariyoshi. Dr Ikhsan will serve as the Chair with a one-year term. ASEAN+3 Macroeconomic Research Office (AMRO) was established to contribute to securing the economic and financial stability of the ASEAN+3 region, which include 10 members of the Association of Southeast Asian Nations (ASEAN) and China; Hong Kong, China; Japan; and Korea. As an international organization, AMRO fulfils its mandate by conducting regional economic surveillance, supporting the implementation of the regional financial arrangements, the Chiang Mai Initiative Multilateralisation (CMIM), and providing technical assistance to its members.